La Cosa Radiactiva is a road trip of engineers, musicians & artists in order to explore several sites related with radioactivity in Madrid area & other places in Spain. We travel fully loaded with our free hardware equipment, designed to measure & visualise the natural radioactivity from earth, as well as the artificial one created by us humans. La Cosa Radiactiva is also about transforming nuclear radiation into image & sound. A research on transparency and nuclear secrets. A performance to demystify radiation while building awareness of its risks. An imagination exercise to reflect on how it would be like to live with radiation and above all this, a call about the importance of citizens having their own tools to be able to verify public health data provided by governmental authorities. All this and more in an ambitious atomic project! 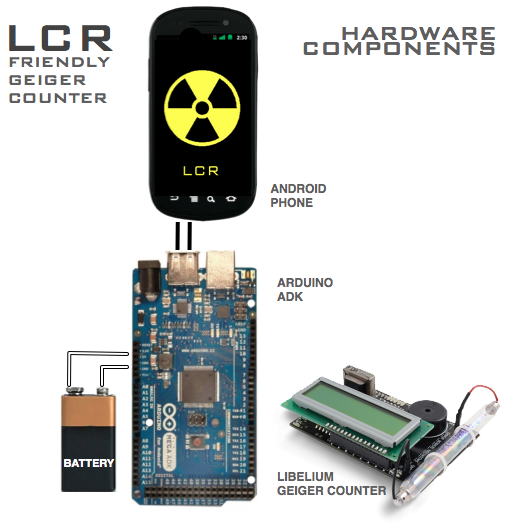 I was mostly involved in the first part of the project, when we developed an open do-it-yourself geiger counter based on Arduino and Android. To be more specific, I worked on the Android implementation (programming in java). I also helped with the Arduino implementation and testing the Arduino – Android interoperability. Plus participating in some of the public events, measurements outings and content generation. From (La Cosa Radiactiva) LCR’s web page you can access to the blog with the content generated by the project. And you have a good interview in Yorokubu. The meter was based on one Arduino kit which implemented the geiger tube and meter itself. The kit was provided by Libelium and hacked to transmit the measures to the Android device. The details about the implementation are here and the code repository in GitHub here. Comparing prototype in its early stages in CMAM (there is an article about the visit in LCR’s blog).